Loaded Lacquer Jiggles - Mysterious Set - Polish Etc. If you have been following me on Instagram, then you are familiar with my intense love of jelly polish. I just love how squishy they look on the nail and that you can create super fun jelly sandwiches with them! The Jelly Sandwich is an easy nail art technique that anyone can do...anyone. I create my jelly sandwiches by layering 2 coats of squishy, jelly polish, then 1 layer of glitter, then another single layer of jelly polish. The possible combinations are endless! 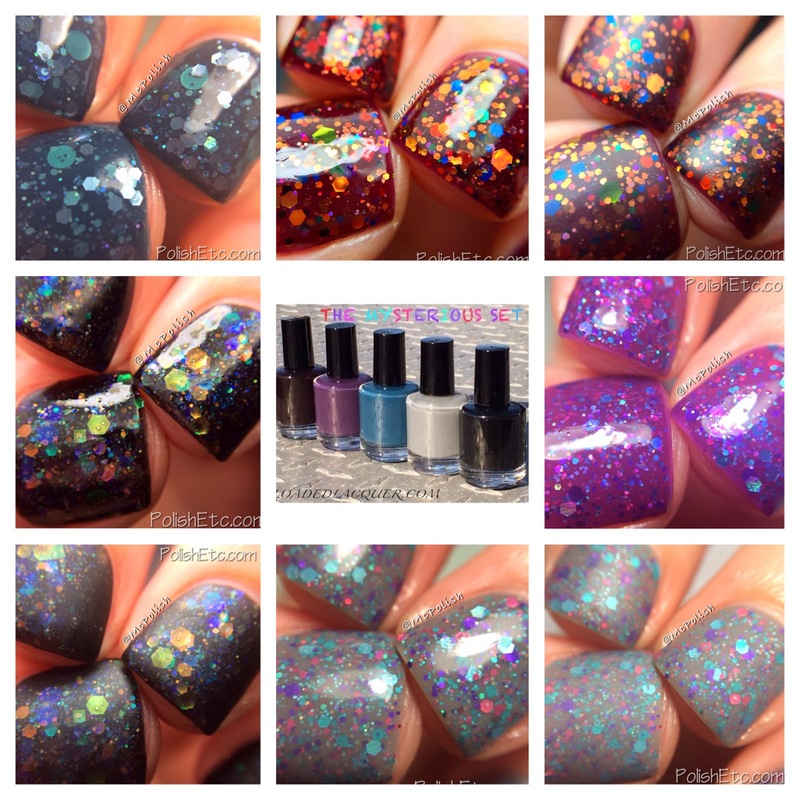 So when I saw that Heather from Loaded Lacquer was releasing 10 jelly polishes called The Jiggles, I knew I needed them all. Nomnomnom Jellies!!! I am sharing my jelly sandwich manicures from the Mysterious Set with you today. These colors are the darker shades of the Jiggles. I used all Loaded Lacquer glitters to make these looks. And of course there is going to be EPIC macros too! Because this post is very picture heavy, be sure to click through to see all the squishy goodness. I am just going to open with my favorite Jiggle and favorite jelly sandwich. "Toasted Marshmallow" is a light grey jelly with blue undertones. I paired it with a holographic glitter bomb called "Dashboard Dancing" which has turquoise, magenta, light blue and purple holo glitters. 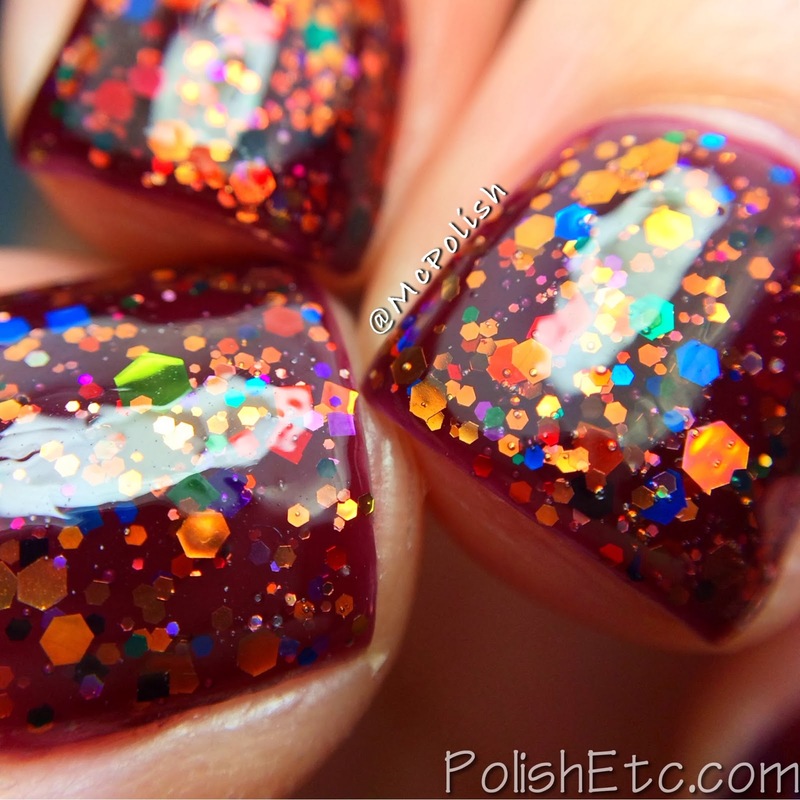 Holo glitters look great in jelly sandwiches! Isn't it perfect! Just look at that macro shot...epic. I had to add a matte top coat to this mani because mattified jelly sandwiches are jaw droppingly gorgeous. Next up is a deep wine colored jelly called "Acai Berry". This polish looks quite dark in the bottle but is a vampy, rich red on the nail. I paired it with "Gold Rush Days" because wine and gold just go great together. Plus, "Gold Rush Days" has several other bright colors mixed in with the gold that really made it pop. ﻿I like how the wine jelly gave the gold glitter more of a coppery look. This jelly sandwich just had so much depth...I could get lost in it. And yes, we had to mattify this baby too! The next Jiggle up is "Wild Blueberry" which is a smoky teal/blue color. I probably have more teal colored jelly polishes than any other color. They just look great with some many glitter color combos. I paired it with "Mintallica" which is one of Heather's most popular glitters. It is a cool combo of gunmetal grey and mint...what is not to love! This next jelly is a little bit brighter than the others in this Mysterious Set. "Fig" is a purple jelly polish that looks much darker in the bottle but just shines on the nail. I also paired this with "Dashboard Dancing" since the colors were quite bright. Last but not least in this Jiggles set is "Licorice", a perfect black jelly polish. I knew exactly which glitter I was going to pair this jelly with as soon as I saw it. "North of the Artic Circle" is an iridescent glitter bomb and iridescent glitters were made to go with black. All of those shifty colors just pop again a black back drop. And they sure do shine behind a thin layer of black jelly polish too! Now that is some color shifty awesomeness! Let's rock it out with a matte top coat. You have been warned...it is epic. Wowza! Adding a matte top coat to jellies just changes everything. You must try it! You can find Loaded Lacquer for sale on her site. The Jiggles have all just been restocked and you can get mix and match sets of five if you like. I will be posting the second half (The Vibrant Set) soon! I can't wait to see your own jelly sandwiches with this set! If you want to share them with me on Instagram, tag me and also use #McSpiration incase I miss your tag in my feed. These are awesome! My favorite look is the first one as well. I love the close up shots of all the glitters. The mattified versions look amazing! Mattification is essential to jelly glitter showcasing. As always I love your jelly sandwiches!! I have been on the hunt for a good matte polish. I've tried Butter but sometimes it's really streaky. Would you recommend one? Essie is very matte, but gets some little white flecks in it as you use up the bottle. I use Tillie Polish matte top coat mainly, but the Loreal one works pretty darn well too.